I was one of the Senior Animators on Archer and worked in a department of 15-20 animators. Each animator was assigned an entire ~30 second scene to be completed in 2-3 days depending on its complexity. I worked on nine seasons / 100 episodes of the show and contributed to its three Emmy nominations and one win for 'Outstanding Animated Program'. This reel is a compilation of my character animation work. I was also the show's Lead Motion Graphics Designer during this time, provided VFX Compositing when required, and created three award winning Multiplatform Storytelling projects. 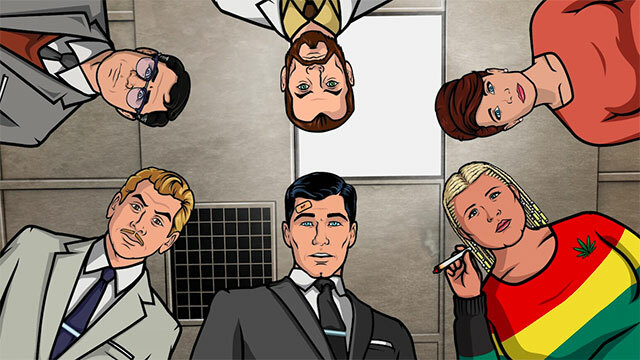 Millions of people around the world watch Archer, but for me that's hard to quantify because it happens out of sight. A surefire way to measure pop culture impact is if fans are expressing their love for the show by creating and sharing GIFs. It's always a thrill to stumble upon a scene I animated when browsing an internet forum or scrolling through Twitter. Here's a few of my scenes from a brief Google search for "Archer GIFs" — some of these have become internet memes in their own right.